It seemed like just another Monday night. Standing in a cool winter breeze under a light drizzle I was waiting for the player of the day award to be announced at my eight year old daughters’ hockey game, when I suddenly felt that uncomfortable sinking feeling in my chest. My heart skipped a beat and was suddenly beating irregularly. It’s always an uncomfortable feeling, but initially I wasn’t too worried, as previous episodes had only lasted seconds, and I knew I was prone to them when I was tired, dehydrated and had recently drunk coffee. Tonight all three criteria were in play so, it wasn’t surprising my heart was rebelling to my poor dietary choices. Previous runs had lasted just seconds before self-reverting and I was hoping like hell this would be the same. Unfortunately, it wasn’t to be. My daughter didn’t receive player of the day, even though she totally deserved it. The award had to be shared around and she received it the first game. Now she was begging me to go get some hot chips from the café which was the last thing I wanted to do. The palpitations were still happening and I was now becoming increasingly anxious, as my usual tricks of gulping down copious amounts of water and trying a covert Valsalva manoeuvre had failed to stop the irregular beats. I snapped at her and said we needed to get going. As we walked to the car I was silently trying to work out how serious this was and whether I should drive home, drive straight to the hospital, ring my wife to come get us, or call an ambulance. Fortunately the palpitations, although uncomfortable, were not causing any major problems. I had no chest pain, I wasn’t overly short of breath (although the anxiety did make me feel that way), and I wasn’t light headed or dizzy. I decided on the first option and headed home to reassess the situation. We made it home safely and I did my best to explain the situation to my now very concerned wife. After attempting further Valsalva manoeuvres and drinking iced water, I decided it was time to seek help. My clinical training meant I was well aware of the complications arrhythmia's can cause, including stroke or even cardiac arrest. I dissolved and swallowed down an Aspirin and made the call I needed to make and then waited nervously for help to arrive. It is always a little disconcerting when you have to ask your colleagues for help. I had no idea who would show up or what their reaction would be. All I knew was that I needed to see my rhythm on a monitor and decide on the next course of action. The vehicle soon pulled up outside my house and I walked into the ambulance to greet the surprised crew and explain my predicament to them. Fortunately I knew one of the paramedics and after explaining the situation they awkwardly attached me to the monitor and printed out an ecg strip for me. As an ICP and University lecturer, I understood they may have felt intimidated treating me, so I tried to keep it light-hearted and disguise the internal anxiety I was feeling with some external smiles and light humour. The 12 lead ecg confirmed I was in a rapid and irregular atrial fibrillation (AF) rhythm with a ventricular response of around 150 beats per minute. 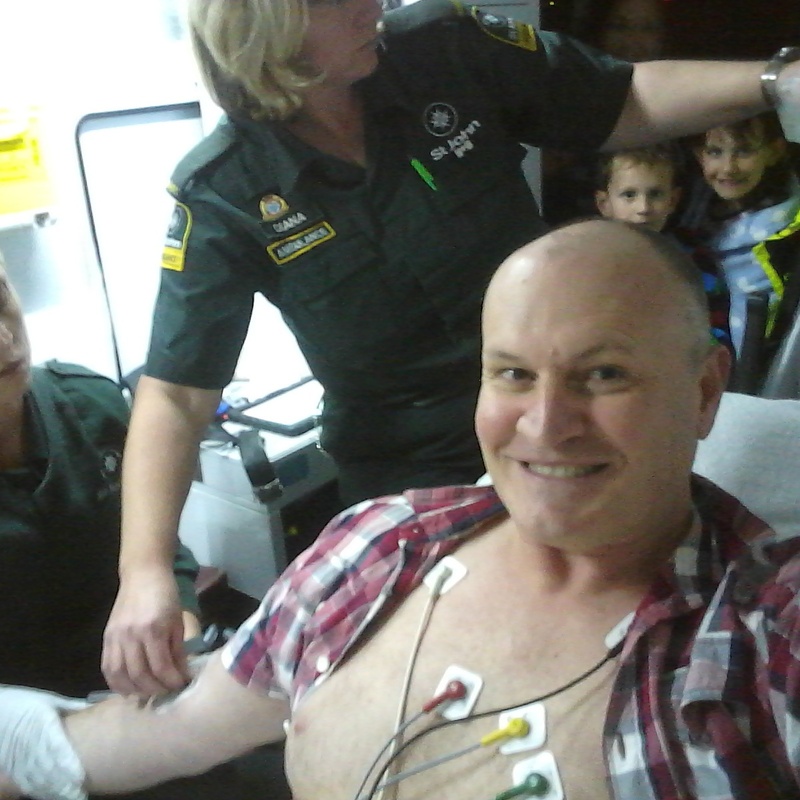 I then asked the crew to please insert an intravenous line into my arm and to give me some fluids. 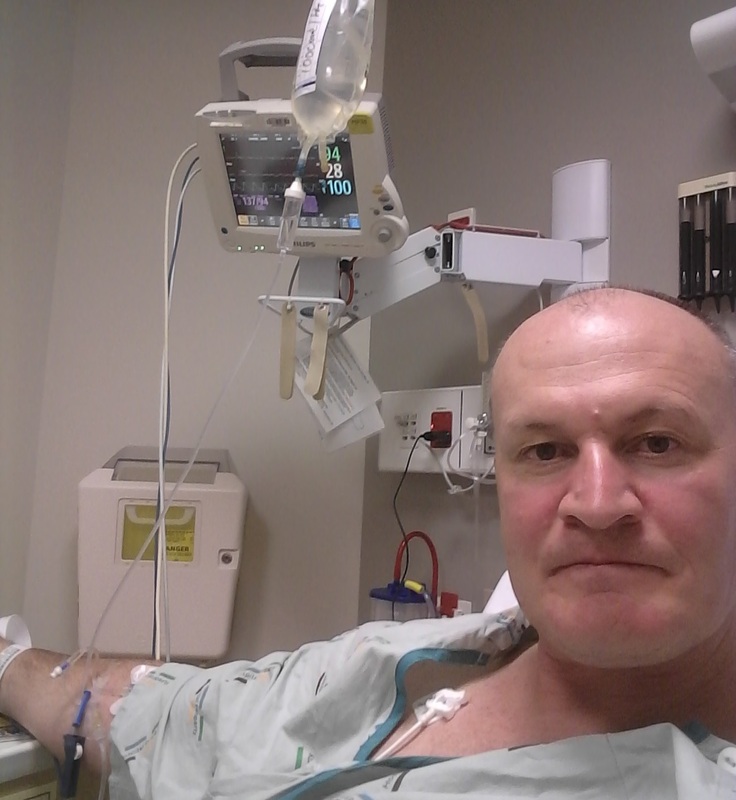 Dehydration can precipitate tachydysrythmias and I personally have had around a seventy percent success rate at reverting patients in these rhythms with fluids alone, so it was worth a shot. My wife and kids had popped into the ambulance to see me so I tried to make light of the situation and explain everything was going to be fine and that I would likely be home that night. Ironically this was the only reassurance that was uttered during the entire experience that night. 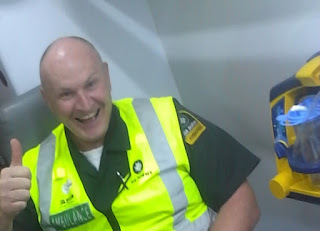 The crew were friendly and did most of the things they were supposed to do during the short trip and it wasn’t long before I was walking into the Ambulance bay of the Emergency Department, waiting to be seen by the triage nurse. There was a female patient in the isolation room that adjoins the bay and she was nutting off, shouting out threatening expletives and obscenities to the psychiatric team that were trying to deal with her. Just hearing her scream and yell made my anxiety shoot up a notch or two and my heart skipped a few more beats. I was soon triaged appropriately and sent through to a monitoring room, thankfully towards the back of the department. The thought of seeing all my colleagues walk past me and stopping to find out what had happened was not a thrilling prospect. I got to my assigned bed in a monitoring cubicle and waited for a nurse to come along. At least lying semi reclined on a hospital bed felt a little better, although my rate had not subsided at all. I started firing off texts to my boss, family and friends letting them know of my predicament. After ten or so minutes a nurse came and introduced herself and gave me the compulsory, but ugly and awkward, hospital gown to put on. The litre of IV fluid was now well on board so when she left I quickly shot off to the toilet to vacate my bladder which was now ready to burst its banks. By the time I came back she had the monitor turned on and was ready to hook me up. With a stern face she told me that if I needed to go again, I needed to use the urinal, especially with a heart rate of between 140 and 160 beats, which the monitor was now colorfully showing. The nurse was actually very pleasant and thorough, and took all the usual baselines, drew blood samples and made small talk in-between writing down her findings. She then took the chart away and informed me the doctor would review the ecg and come and see me sometime soon. Although polite and professional, she didn’t mention the words I was waiting for – that everything was going to be ok. Meanwhile I was researching all I could about AF. Causes, cures and treatments. Dr Google was continuously presenting cardioversion as being a treatment option which was rather disconcerting. This would involve being sedated and a synchronous shock being delivered from a defibrillator to try and stun my heart back to a normal rhythm. We only administer this for seriously compromised cases so I decided I would not opt for that treatment should it ever be offered. The reassuring thing, however, was that according to most of the clinical literature I could actually find, AF seemed to spontaneously self-revert within 24 hours in the majority of acute cases. I decided that I was going to be one of those cases. It was time for some positive mental affirmations. The IV fluid the ambulance crew gave me was sure doing its job and I was onto filling my second cardboard urinal already. As I stood up to awkwardly pee into the fragile container, I suddenly felt my palpitations stop and my heart resume into a normal rythm. I looked up at the monitor, and to my delight, I had self-reverted back into a sinus rhythm, although it was still a little fast at 115 beats per minute. I lay back on the bed with a sigh of relief as the anxiety left me for good. Suddenly, a visitor pulled back the cubicle curtain and popped his head in. Tony, my boss, had made a surprise visit to come and see me. It was a welcome relief to have someone familiar to chat to, especially when they are also a clinician. We spoke about our work and my condition and he told me to call if I needed anything. With my wife stuck at home with my two young children in bed, his visit was the boost to my morale that I desperately needed and I genuinely thanked him for taking time to pop in. I doubt he realises even to this day what a positive impact his short visit had. After Tony’s visit, the doctor came in next and introduced herself. I gave her the history and explained I had just self-reverted about twenty minutes ago. She did her examination and said she would check the bloods, ecg, chat to the cardiologist and decide on a plan. Although pleasant and professional there were still no words of reassurance, not one, although the condition had normalised. Shift change came around and a new nurse introduced himself. Apparently the blood results showed I was slightly dehydrated and slightly low in potassium so he gave me a fizzy drink with potassium to gulp down and attached another litre of saline to my IV. Given that my heart rate was now slowing down, I didn’t really mind what he did. I was finally starting to relax and fired off some more texts to let everyone know I was now ok. I even managed a few selfies in between reading a magazine article. After another twenty minutes the doctor returned and gave me the all clear. Bloods were back to normal and the ECG had normalised too. She kindly gave me discharge notes and copies of my ECG’s and said my risk factor for stroke was zero which was great news. Four and a half hours after being admitted, I was finally free to go. After painfully removing the ECG electrodes, along with a decent amount of chest hair, I headed home. 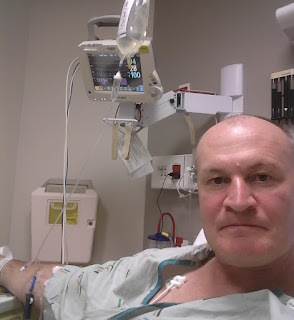 Being a patient was a sobering experience for me. For someone who has operated on the other side as a clinician, it was both educational and insightful. As a lecturer, I teach my first year paramedic students that reassurance is a vital part of the treatment process. Our patients are literally hanging out for us to utter those magic words – “things are going to be ok”. It is a fundamental principle we learn as children, when a hug from mum or dad cured any amount of anxiety, or injury and although it’s not necessary to hug our patients, uttering that simple sentence can make a world of difference. Despite being a clinician, as a patient I felt vulnerable and those words would have reduced my anxiety and my heart rate, had they been uttered by any of the clinicians that treated me. I have made a vow to ensure I continue to reassure my patients and also their relatives, explaining the medical condition, providing options for treatment and reinforcing any positive baselines that I record. I will also ensure I shave hairy chests before attaching ECG electrodes, as removing them was the most painful part of the entire experience. Finally, I bought myself a large drink bottle and will make it gospel to drink at least two of those each day. Despite the great insight, I much prefer to stay on the clinical side of the patient fence.